The exciting news of late is that WE GOT A DOG! For the last year, David and I have been actively discussing adding a dog to our family. Will and Fritz have begged us to get a dog and we really wanted to make it happen for them, and for our family in general. William had been asking me almost every day if we could get a dog. Now that Louisa is potty trained and we are out of the "baby" phase, we were in the process of trying to find a good fit and we thought that we could figure out a way to bring a dog into our home as a Christmas surprise. While the idea of getting a puppy was really tempting, we wanted to find a dog to adopt and the local shelters here won't adopt puppies to families with young children (which I now totally get). I also was really nervous about the responsibility of training a puppy. So, we scoured rescue websites and looked at our local shelters. I actually found a dog really similar to Charlie at a shelter in Phoenix but they weren't able to send him here. I was sad when it didn't work out, but Charlie was meant for our family. 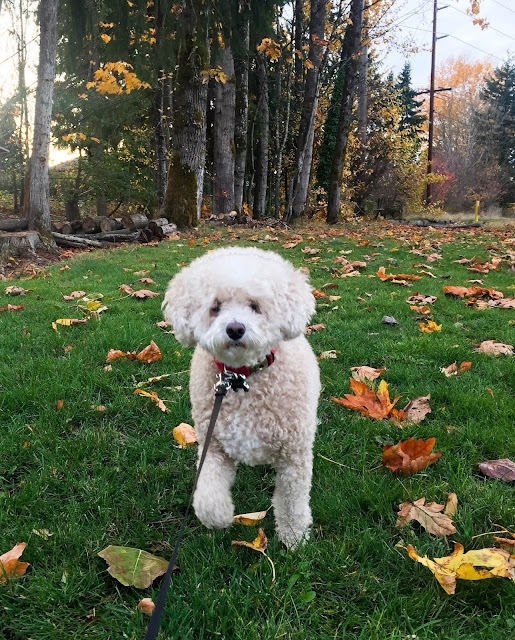 Last week, I got an e-mail from a friend who said that her friend was trying to rehome her Miniature Poodle because of some extenuating circumstances that made her unable to keep him. I saw his picture and fell in love. I immediately called her and we set up a play date for them to meet me and for me to meet Charlie. When that went well, we had him over to our house for a trial while the boys were at school (we were still trying to surprise them). Lulu and I spent the day with him, which was really great because she has been really nervous around dogs so she got a lot of time with him by herself to get used to him. He has been really great with her and she is obsessed with him. The next day, we brought him home for good. The previous family did not want to let him go. They dearly loved him - you can really tell because of his wonderful training and he is a sweet, well-cared for dog. They were heartbroken to have to rehome him, but we are so grateful because now we get to love him for the rest of his life. He has two families who love him and want the best for him - it's a good situation for all of us. His name is Charlie and he's six years old. He's a cream-colored Miniature Poodle so he doesn't shed like other dogs and he weighs about 20 pounds, the perfect size for our family. He was already named Charlie - which is perfect because a) it suits him b) it was on my list of dog names c) it's not similar to any other names in our family so it's not confusing when we call him. 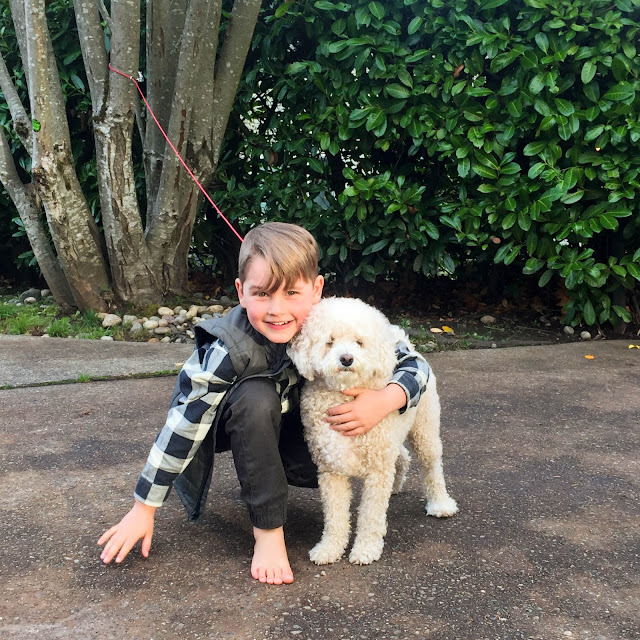 We love petting his snuggly, curly coat and watching his floppy ears when we play fetch. 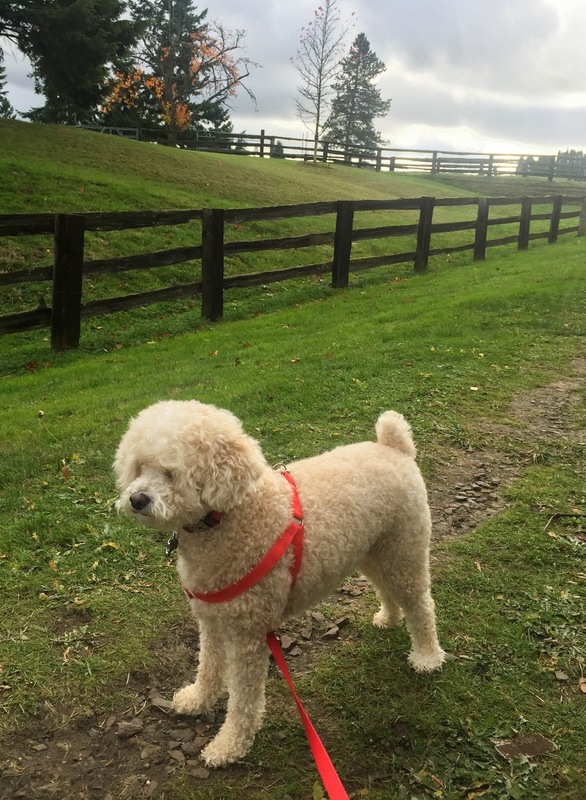 Did you know that poodles are retrievers? They were originally hunting dogs and are excellent swimmers ("poodle" is derived from the German word "pudel" - meaning to splash in the water). They're also one of the smartest dogs and he is proof of that. He knows what we're saying - he does the cutest little head tilt when we ask him questions. He is also so easy to train - which, in fairness, his previous family did most of that long before he came to us. He's pretty much the perfect dog and we all can't get enough! Quick story about the history of my dog dream. When I was about 10 years old, I begged my parents to let me get a dog. As the 10th of 11 children, my parents were just a little busy and they didn't want to add another responsibility to the family when my mom knew that she would end up doing most of the work. So, I set out to prove to them how responsible I would be. I knew my mom liked Beagles so I pulled out the dog encyclopedia that was in my parents' library and read all about Beagles. Then, I decided to write a book report. I pulled out five sheets of lined paper and wrote out a Table of Contents, a report on the history of Beagles, their training and food needs and all the ways that I would do the work taking care of him. I even cited reference (haha). I drew pictures and put the pages in sheet protectors, held together through the holes with yarn. I humbly presented it to my parents, sure that it would change their minds. They smiled, read it and approved of my work... but they still said no. I never stopped dreaming of the day I would get a dog. 23 years later, here I am. The sweetest little pupper follows me around the house, licks my face in gratitude when I pet his fluffy face and no one has ever been so excited to see me when I get home. We love Charlie! looks darling. but not much of a poodle nose. Maybe a bichon poodle mix? or a retriever mixed with a poodle.